Traditionally, buying a mattress consisted of going store to store testing out and searching for the most comfortable mattress. Since online brands have become more popular, they’ve changed how consumers research and buy mattresses. Now, consumers are able to buy products directly from the mattress brand itself instead of going through a mattress retailer. By eliminating the middleman, you greatly reduce the price of the mattress and receive more transparent information about the brand and mattresses they sell. To help you navigate the high number of brands available, we will be consistently updating this page with the most recent mattress reviews. We will also discuss the main types of mattress types out there, to help you find the best mattress for you. There is no “one size fits all” mattress in the market. Mattresses vary in materials, size, layer composition, and so on. Mattresses are often made from foam, latex, innerspring coils, or a combination of all three. Before we review specific brands, we are going to provide information on the different types of mattresses and their pros and cons. Polyurethane foam, otherwise known as poly-foam, is commonly used in mattresses, mattress toppers, and couch cushions. Pros: Poly-foam is often low in density, resulting in minimal risk of sleeping hot because air flows easily through the foam. Typically, poly-foam is inexpensive to produce so beds made with poly-foam are more affordable than other options. Memory foam is similar to polyurethane foam; however, it has viscose and elastic properties that poly-foam does not. Viscoelastic polyurethane foam, or memory foam, is plush and contours to your body. Cons: A common complaint with memory foam is that it’s toxic, expensive to produce, and can sleep hot. Because of this, companies choose to create their own comfortable and lasting poly-foam, or they decide to modify their manufacturing process of memory foam to eliminate toxic chemicals and increase its ability to reduce heat. Gel-infused foam can be either poly-foam or memory foam, and it is made by adding cooling gel into the foam. Pros: Adding gel into foam creates a cooling sleeping environment and reduces the chance of the bed trapping heat. Gel also provides additional support to the memory foam, ideal for someone who enjoys a firmer bed. During the manufacturing process of plant-based memory foam, a portion of petroleum is replaced with plant-based ingredients such as soy or plant-derived oil. Pros: Because some petroleum is replaced with plant-based oil, the chances of unpleasant off-gassing smells emitting from the mattress is significantly reduced. By replacing petroleum with plant-derived oils, it makes your mattress healthier for both you and the environment. Cons: Because only a select few mattress brands, such as Loom & Leaf and Amerisleep, use plant-based foam in their mattresses, there is not much information online about the material. Because of this, we recommend researching the other materials in the mattress and ensuring the mattress is a good fit for you, and not just buying it because it’s an eco-friendly option. Latex creates a bouncy, responsive feel to the surface of your mattress. Pros: Similar to memory foam, latex contours to your body and provides pressure relief— they’re an excellent choice for those who suffer from joint pain because they offer exceptional pressure and pain relief. Positive reviews about latex beds include they’re long-lasting, odor-free, and virtually silent while you get in and out of bed or toss and turn. Despite their bounciness, latex mattresses score decently well in regards to motion isolation because of the materials resiliency. If you’re looking for an all-natural or organic bed, latex is the way to go because it is derived from the sap of rubber trees. Latex mattresses are free of toxic chemicals, allergen-free, resistant to mites and mold, and environmentally friendly. Hybrid mattresses are made from two or more different materials, whether it be foam and latex, foam and innerspring coils, or latex and innerspring coils. These mattress types aim to capture the benefits of multiple materials while masking the cons of each. Pros: Hybrid beds are typically bouncier than all-foam or latex beds due to the coil system included in the design. The layer of memory foam or latex is added to comfort and contour to your body while you sleep, and the coil system below provides targeted support. Cons: A complaint with low-quality hybrid mattresses is the coil systems can cause pressure points and discomfort. Additionally, a good-quality hybrid can cost a bit of money. Unless you have the budget to accommodate a good hybrid bed, we recommend choosing another type of mattress instead of opting for a cheap hybrid. Innerspring mattresses are the oldest mattresses in the market. They’ve been around since the 18th century and envelope multiple different coil systems; the Bonnell coil, the Offset coil, the Continuous coil, and the Pocketed coil. Pros: Pocketed coils are individually encased in fabric, allowing them to move independently of one another; this coil system provides great motion isolation throughout the bed and is the most widely used coil type. Continuous coils, Bonnell coils, and Offset coils are not as prevalent as Pocketed coils; they’re commonly found in low to mid-priced hybrids and provide a bouncy surface for the bed. Innerspring beds are usually found in hotels, campers, and college dorm rooms because they are cheap to buy. For this guide, we’ve taken a detailed look at some of the biggest bed-in-a-box brands and broken down the ins and outs of the mattresses they carry, sleep trials, and warranties. 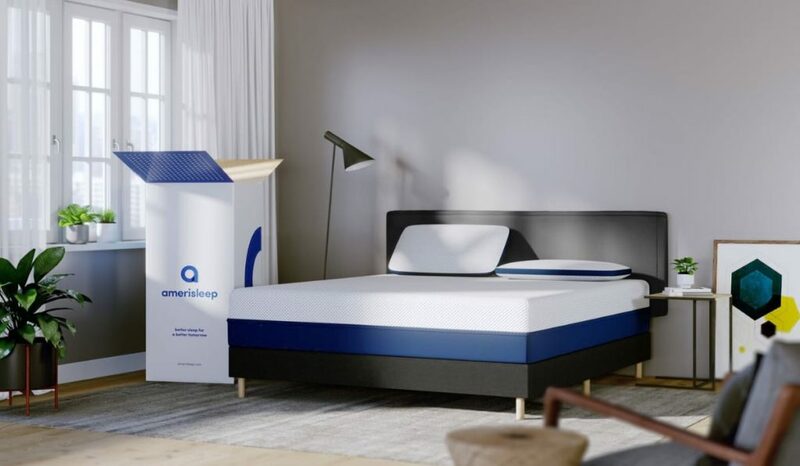 Since 2007, Amerisleep has been selling their mattresses online; but in recent years, they’ve begun opening their own showrooms in select states. They sell five different mattress models, made from both poly-foam and plant-based memory foam. Their five models range in firmness and are recommended for types of sleepers. For example, their AS1 and AS2 make up their firm collection and are recommended for back and stomach sleepers. Their AS3, AS4, and AS5 complete their soft collection and usually are recommended for side sleepers depending on their body type and preference for firmness. 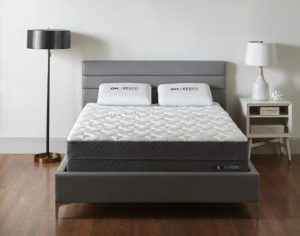 Amerisleep’s AS3 is their most popular and versatile mattress model; it is medium firmness and recommended by them for back, side, stomach, and combination sleepers. All Amerisleep mattresses contain their Celliant® cover which is FDA-determined to promote better sleep. Each mattress also uses Amerisleep’s unique Bio-Pur® foam— this plant-based foam is five times more breathable than standard memory foam. These two technologies considerably reduce your chances of sleeping hot on this mattress. 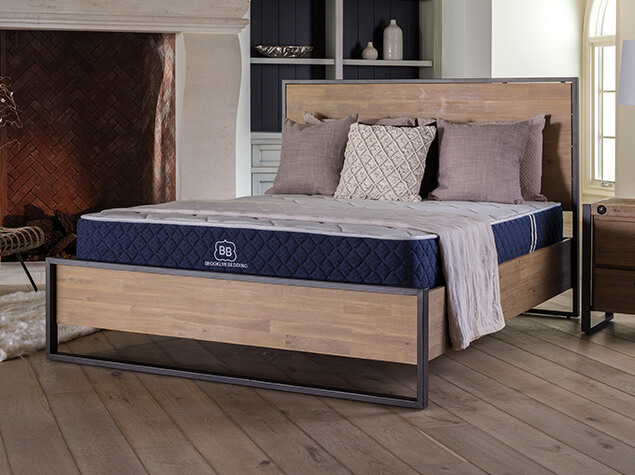 Aireloom and Kluft mattresses are found at high-end mattress retailers across the country. Founded by E.S. 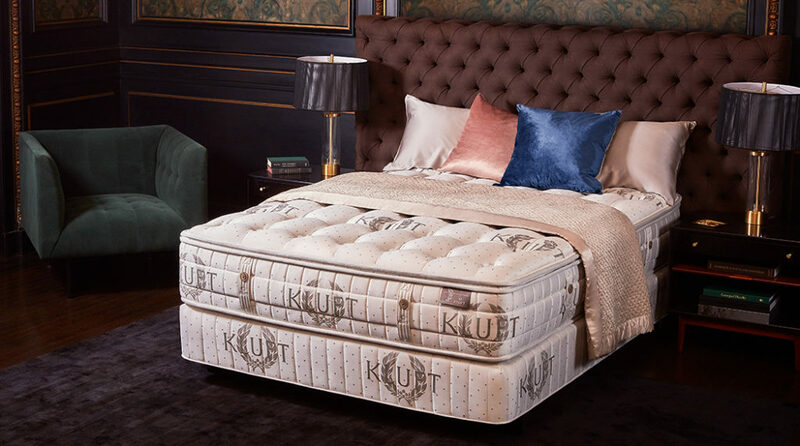 Kluft & Company, these beds are designed to be the epitome of luxury. If you’re looking for a truly upscale bed, one of these mattresses should be a good fit for you. Both Aireloom and Kluft mattresses are made from state-of-the-art materials such as high-quality foams and latex, pocketed coil systems, Joma® Wool, silk, Tencel®, and much more. A significant selling point of these beds is they’re all handmade, which should guarantee all of these mattresses are high-quality and well-crafted. The price of these beds can range from $3,000 to $30,000, based on the size and materials used in the mattress. Depending on where you buy one of these mattresses from, it may come with a sleep trial, giving you the chance to test your new bed out in your home. To learn more about these beds, read our full guide. Brooklyn Bedding was founded in 1995 when brothers John and Rob Merwin started selling “like-new” mattresses from the back of a Wonder Bread truck. During this time, they decided to tear apart some of their inventory and learn about what goes into building a comfortable, supportive bed. With their newfound knowledge, the Merwin brothers started building their own mattresses under the name Brooklyn Bedding. When they first started, they sold their beds on Amazon only; but after perfecting the “mattress-in-a-box,” the Merwin brothers launched their own website and started producing and selling their beds at a much faster rate. With their quick success, they ended up building their own manufacturing facility, giving them complete control over the materials and production of their beds. Now, they sell six different mattresses made primarily from poly-foam and pocketed coil systems. For more information about their different beds, read our full Brooklyn Bedding Review. Casper made its grand debut in the mattress market in 2014. Since then, they’ve opened locations in states all over the US and partnered with Target® to sell their products in Target® stores nationwide. They carry three different mattress models made from both memory and poly foam, and other accessory products such as dog beds, lights, and nightstands. For more information on Casper beds, read our Casper Mattress Review. 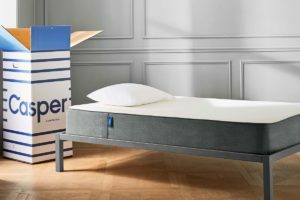 In 2015, CEO Mark Werner launched GhostBed after struggling to find a mattress that he felt was comfortable for his sleep style. An extension of Nature’s Sleep, GhostBed mattresses are sold exclusively online and are shipped to your doorstep in an eco-friendly easy-to-manage box. When they first hit the market, they only sold one mattress, the GhostBed. Now, they carry three different beds— the GhostBed, The Flex, and the Luxe. The primary materials used in the layers of their original GhostBed are latex foam, gel memory foam, and poly-foam. Their Flex model is their only innerspring bed; this mattress combines foam layers with a pocketed coil system. The Luxe is, as you can probably guess, designed to be their most luxurious model. For this mattress, GhostBed designed and used their own proprietary cooling technologies and foams to offer its customers the most high-quality mattress they could. Every GhostBed comes with a 101-night sleep trial and a lengthy warranty. The price of a Queen size GhostBed mattress ranges from $995 to $1,575. To learn more about who these mattresses are good for, read our full GhostBed Review. Loom & Leaf™, or L&L, is a subsidiary of Saatva mattresses. The L&L bed is only sold online on their Loom & Leaf™ website. When you buy online, it comes with a 120-night sleep trial that lets you test the mattress out and decide if you want to keep it. The return will cost you $99 if you decide it’s not for you. Purple® was founded in 2015 by two engineers, brothers Tony and Terry Pearce. 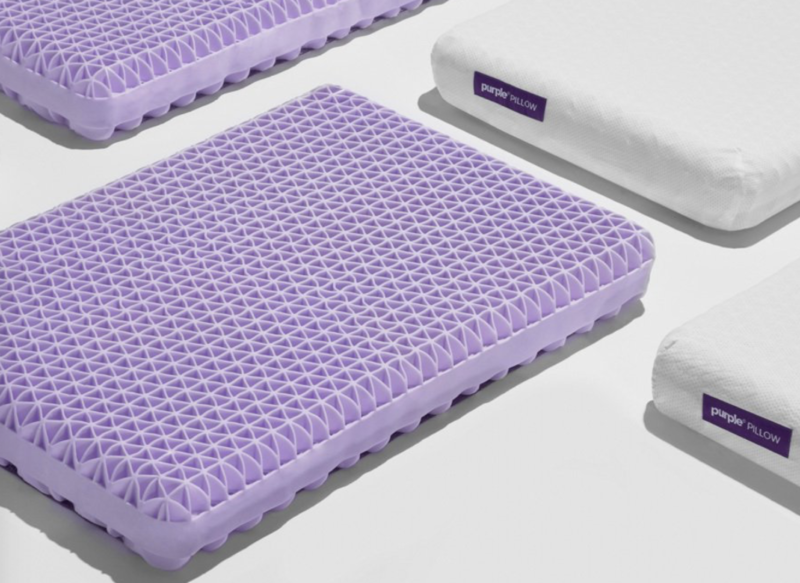 They invented their unique mattress material which is the selling point of all Purple® mattresses— hyper-elastic polymer foam. Using this material, they made a Smart Comfort Grid™; this grid is designed to adapt to your body regardless of your sleeping position and relieve pressure points and keep your spine in alignment. Additionally, the grid design allows for air to flow through the mattress, reducing your chances of waking up hot during the night. Check out our post on Purple mattress reviews for more information. Tuft & Needle®, or T&N, was founded in 2012 by two software engineers. At first, they only sold their Original Tuft & Needle mattress, and then they introduced a second mattress model called the Mint™. Both of these mattresses are made using poly-foam, specifically, T&N’s Adaptive Foam®; this foam was designed by T&N to feel comfortable to the sleeper above while relieving pressure points. Additionally, these mattresses are CertiPUR-US® certified. The Original T&N mattress had two layers— a layer of Adaptive Foam® for comfort and a dense, supportive base layer below. The role of the base layer is to provide support for the comfort layer above as well as maintain the integrity of the bed over time. The Mint™ differs from the Original T&N mattress because it has a transition layer the Original does not. The Mint™ has three layers, the Adaptive Foam® layer, a transition layer, and a supportive base layer. This transition layer creates a barrier of cushion between the comfort and support layer, preventing you from sinking straight through the Adaptive Foam® layer onto the tough support layer below. Both of these mattresses are designed for universal comfort and are considered to be medium firmness. The covers of both T&N mattresses are integrated with heat wicking graphite and cooling gel, to prevent you from heating up during the night. For more detailed information, read our complete Tuft and Needle Review. 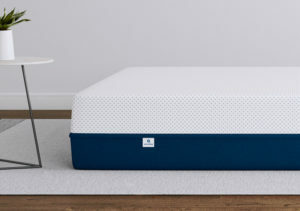 As we mentioned, we’ll be updating this guide regularly with reviews for various brands in the mattress industry to help you find the best mattress to meet all your sleep needs. Be sure to check back for updated review articles, and feel free to comment which brands you’d like us to cover next.